Helps protect sensitive soft water tropical fish from hard water. Also eliminates white, crusty mineral deposits on aquarium surfaces. Great for planted aquariums and aquariums housing angelfish, neon tetras, South American cichlids or any freshwater fish from soft water environments. Rechargeable resin may be successfully used multiple times to replicates natural, soft water conditions in the home aquarium. Safe for delicate tropical fish. Small ready-to-use pouch is for aquariums up to 20 gallons. Benefits: Scientifically proven to reduce GH (general hardness) by lowering calcium and magnesium. Also removes heavy metals and reduces white crusty minerals on aquarium surface. 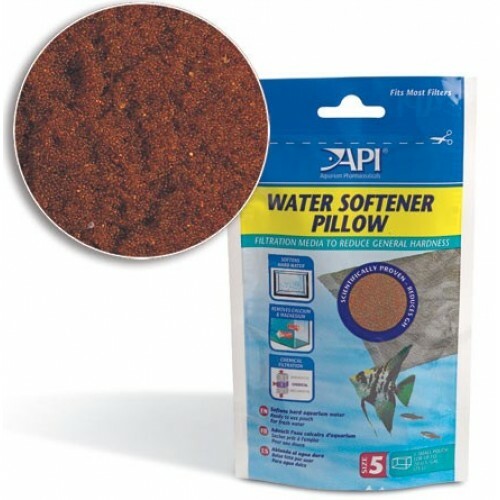 API Water Softener Pillow can be reused after it is recharged in a salt solution. When starting or maintaining an aquarium or when testing indicates water hardness above the desired level. Rinse pouch under tap water. Place pouch in path of water flow in the aquarium filter. Activity of the pillow lasts 48 hours. After 48 hours, recharging is necessary. Dissolve 3 tablespoon of aquarium salt in 7 oz of tap water. Rinse pouch in tap water, then soak in salt solution for 2 hours. Place back in filter – there is no need to rinse. When not in use, store Water Softer Pillow in recharging solution. Do not let pillow dry out. Replace when Water Softener Pillow ceases to function properly after recharging. For over 50 years, API has been a leader in the Aquatics industry developing and perfecting products and solutions for indoor aquariums. API's family of products includes treatments, testing, nutrition, and equipment and pond products. API continues to look for ways to improve the fishkeeping experience for everyone. API recently developed the Easy Care Guide for a simple way to care for your aquarium. Easy to follow symbols help correlate in store products with at home care. These steps will show you how to simplify aquarium care so you can spend more time enjoying the beauty of your aquarium.